The Construction work at Hindutva Icon Chatrapati Shivaji’s statue stopped by Supreme Court. Sabarimala, Sri Ram Temple, Shivaji Statue….. Supreme Court Goes Against Majority Hindu Sentiments One After Another….. Setback for Maharashtra BJP & CM Fadnavis! Construction work at Hindutva Icon Maharaja Chatrapati Shivaji statue in Arabian Sea stopped after SC notice. Setback for CM Fadnavis! Construction work at Shivaji statue stopped after SC notice. The construction work on the 212-metres Chhatrapati Shivaji Memorial statue in the Arabian Sea off Mumbai coast has stopped after the recent Supreme Court notice. 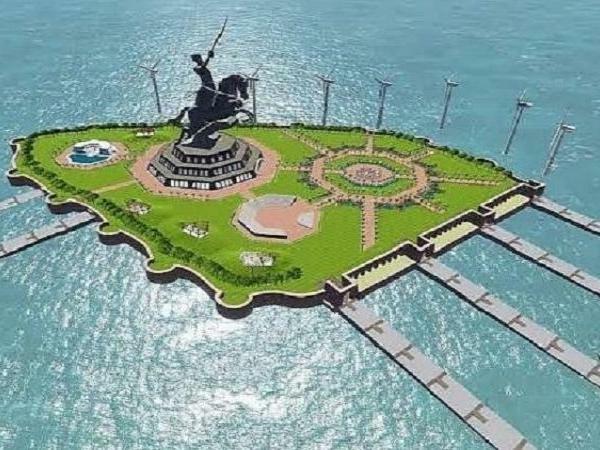 Times Now Digital | Mumbai | Jan 16, 2019:: In a major setback for Devendra Fadnavis Government’s plan to construct a Shivaji memorial statue in the Arabian Sea, the construction work on the statue has stopped after the recent Supreme Court order. The Public Works Department has written to the contractor to stop after SC orders. Maharashtra can government can, however, file a fresh affidavit in the court. The Chhatrapati Shivaji Memorial project to be built at a cost of Rs 3000 crore ran into hurdles after SC issued a notice after hearing a petition filed by Conservation Action Trust (CAT) against the statue of the Maratha warrior king. In the letter written by PWD to the private company constructing the statue, the authority cited the SC notice and its directive to the state government counsel to stop the construction work until the matter is heard. Earlier, a special bench constituting the Chief Justice of India Rajan Gogoi and Justice SK Kaul admitted a petition filed by the environmentalist Debi Goenka seeking a stay on the construction of the memorial. Hindustan Times reports that they have accessed a copy of the letter to Maha Govt to PWD to stop work. “As per intimation of the order dated January 11 passed by the SC, the court has asked the state not to proceed with construction activity of the Chhatrapati Shivaji Maharaj Memorial (CSMM) in the Arabian Sea. You are requested not to proceed with construction activity with immediate effect,” read the letter issued by the executive engineer, CSMM project division, PWD, Cuffe Parade. HT had reported on Saturday that the SC bench consisting of Chief Justice Ranjan Gogoi and Justice SK Kaul had admitted a special leave petition (SPL), challenging the construction of the Shivaji memorial and issued notices to various respondents from the Maharashtra government and the Centre. The petition was filed by city-based environmentalist Debi Goenka from Conservation Action Trust (CAT) after seeking a stay on construction from the Bombay high court (HC). However, the HC did not grant a stay to Goenka’s petition and allowed the construction of the Rs 3,600- crore project. Goenka approached the Apex Court, saying that the Maharashtra government had not called for public consultation before going ahead with the project and had refused to address issues related to loss of marine biodiversity and environmental destruction. The counsel representing the state was present during the hearing on Friday as the Maharashtra government had filed a caveat prior to CAT moving Supreme Court. Another letter, which HT has a copy of, issued to the principal secretary, PWD by advocate Nishant R Katneshwarkar, counsel for the state in SC, highlighted the oral directions by the SC bench. “The court has orally asked the state not to proceed with the construction activity… the state will have to file a counter affidavit in response to SPL. You are, therefore, requested to depute a responsible officer to give instructions to prepare and file a counter affidavit,” the letter read. Courtesy: Times now and Hindustan Times. This entry was posted on January 16, 2019 by hinduexistence in Anti National, Anti-Hindu, Attack on Hindu Sentiments, Attack upon Hindu Sentiment, Conspiracy against Hindus, Hindu Tradition and Culture under attack, Hindus are attacked under Indian Polity and Judiciary and tagged Chatrapati Shivaji statue in Arabian Sea, Chatrapati Shivaji statue stopped by Supreme Court, Conservation Action Trust (CAT), Devendra Fadnavis, Setback for Maharashtra BJP, Supreme Court Goes Against Hindu Sentiments.